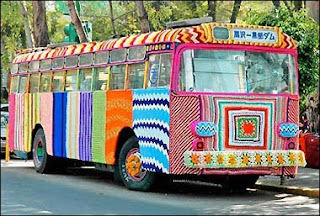 There seems to be a growing trend lately of knitting or crocheting big, and I mean ...BIG. Oh, and add out-of-doors to that! 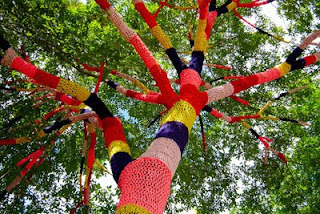 Yarn bombing, also called yarn storming or knit graffiti, is a type of street art (like graffiti or chalk drawings) that has gotten a foot hold now around the world it seems. There's a book out on the subject by Mandy Moore and Leanne Prain called Yarn Bombing: The Art of Crochet and Knit Graffiti. And you can see more examples of this on their website. A bus in Mexico City covered by artist Magda Sayeg. Stitches on the Bridge, an event to celebrate Homecoming Scotland 2009 and to raise money for local charities, aims to cover the Skye Bridge in Scotland with knitting. Donations have come in to this group from not only all over Scotland and the UK, but from all over the world. They'll be covering the bridge October 23-26, 2009. Can't wait to see the pics of this one! UPDATE: Here are the final photos of the Stitches on the Bridge event!